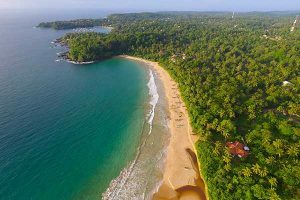 Surya Lanka is situated directly on the stunning Talalla bay, providing an ideal location for guests seeking an Ayurveda Resort in Sri Lanka. 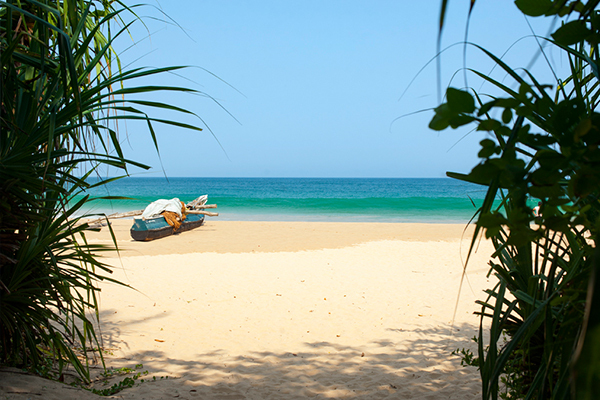 Located in the deep south of Sri Lanka – an area of the country world renowned for its golden sandy beaches fringed by tropical vegetation – secluded Talalla stands out as an oasis, away from the mass tourism areas along the rest of the coast. 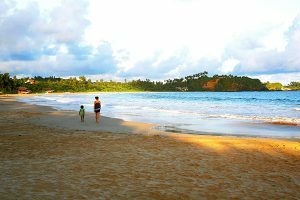 The Ayurveda Resort enjoys absolute beach frontage, with direct access to the 1km long bay and the warm, clear blue waters of the In-dian Ocean, which is ideal for swimming in during the European winter months. 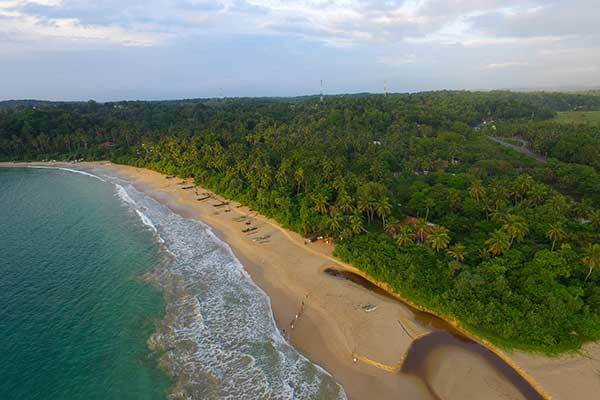 Throughout Surya Lanka’s twenty four years of Ayurveda in Sri Lanka guests have consistently made special mention of the picturesque beach and their scenic sunset walks along the bay. 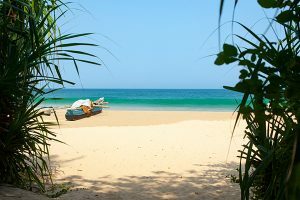 Talalla is also one of the last beach boy/seller free beaches in Sri Lanka, where guests can watch the fishermen bring in the day’s catch and enjoy long walks undisturbed. The hotel itself is built on a former coconut estate. The original palm trees provide shaded areas where guests can lounge on garden beds or hammocks in between their Ayurveda treatments. Those seeking sun can use the deck of the 18-metre freshwater swimming pool. The informal dining area is located in the palm garden surrounded by Coconut, Jam, Bamboo and Kohomba trees, allowing guests to dine in the midst of nature – further contributing to a sense of peace and harmony. The focal point of the property is the ancient Banyon tree whose branches provide a cooling respite, and whose aerial roots grow from day to day. Elsewhere the garden is lushly vegetated with white flowering temple trees, colourful Hibiscus and a range of vivid Bou-ganvillea colours, along with tropical fruit trees such as mango, papaya and banana. Animal life also is abundant – a variety of birds, butterflies, Iguanas and a colony of monkeys call the area round Surya Lanka home. Located approximately 165 kms south of Colombo, a beach away from Dondra lighthouse – the southernmost point of the country – Surya Lanka boasts one of the best locations for an Ayurveda holiday in Sri Lanka.